A US Naval ship can often go it's entire service life without anything major happening to it. Some hulls are destined for greatness. 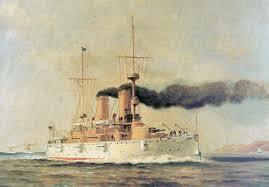 The USS Olympia is one of those that was there when history unfolded and great things . She was Admiral Dewey's flagship at the Battle of Manila Bay, in which she decimated the Spanish Fleet, took control of the Philippines which marked the U.S.'s emergence as a world naval power. It was from Olympia's recently restored bridge that Dewey delivered his famous order, "You may fire when you are ready, Gridley." 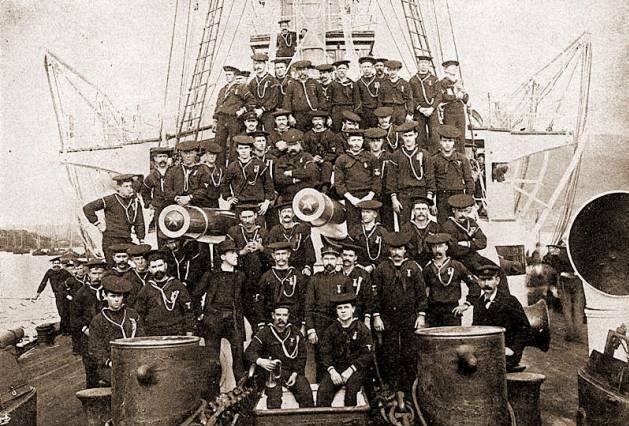 No men were killed or wounded in the 8 hour battle. She served During World War One in keeping the merchant fleet and coast safe from U-boats. After the war, she was sent in harm's way to assist in combating the Bolsheviks in Murmansk, Russia. This was the only time the US landed naval infantry on Russian soil to combat the communists. Her last official naval mission was to carry the body of the Unknown Soldier from France to the United States in 1921. Even with these important battles and missions, it is important to remember that she was home to thousands of Officers and men in her 30 years of active service. Men Lived their normal lives, woke up, worked, ate, slept, mended clothes and all the little tasks that re required. The ship had it's own on board newspaper called the "Bounding Billow". Men lived their lives, and yes, men died in the service of their country, not in battle with weapons firing, but in the daily routine. There is training that has to be realistic so when the real thing happens, you are ready. Accidents happen. Life at sea is a dangerous proposition in modern times, at the dawn of the 1900's, even more so. The most famous spirit of the crew is 'Gunner' Johnson suffered a grizzly death. He was killed on 20 Apr 1895 in a training accident during the ships first firing exercise. In a mishap he was crushed by the barrel of one of the big 5 inch guns. And danger could be a little more specific in some cases. Suicides were reported. Even murders. One sailor lost his leg when an anchor cable snapped, and still another fell 40 feet from the deck into the engine room. Disease took it's toll. On her maiden voyage to take up as the flagship of the Asiatic Fleet, she had to stop due to a deadly choleric outbreak. All told it is amazing there are only 19 documented deaths on board. For a ship that sailed the world and fought in several wars, it is an amazing record. Still in 30 years of service, 19 brave men gave their all. They may still be on-board serving. People have reported disembodied voices, full body apparitions and other instances of contact on this grand lady. Among the most active spots on the ship are the engine and boiler rooms. After he was grabbed, he heard a female disembodied voice say 'I think he's OK,' followed by a female laugh. A member of another paranormal team was doing an EVP session in the boiler room when she felt a presence. She reportedly captured an EVP of a male saying " I think I'm in Love"
Kevin a 14 year old son of a volunteer was working with another volunteer in the engine room when he said they saw a dark form dart across a doorway. The same day they saw the reflection of the figure in a pane of Plexiglas, turned around, and saw nothing. "I looked at the other volunteer, and I couldn't explain his face," said Kevin"He looked lost. We both ran out." A visitor said she saw an apparition of a man appear. "It came out of a corridor, turned right, walked [to the rear of the ship], and dissipated into the darkness. I could see what he was wearing - boots, slacks, a button-down shirt, and short-brimmed hat." Many visitors have told staff about a man who is translucent and appears in front of them. They have also reported a man in a white Naval Uniform walking about as if on his rounds. EVP's have captured voices yelling to get out. Also reportedly once - " Save the Ship". As to the last EVP, the ship is in danger of being moved to another City or sunk off Cape May if funds are not raised to restore her. So if you are in Philly Area, stop by during the day and take a tour. I think they are offering nighttime ghost tours as well now. She is a grand Lady who deserves our respect and care, no matter how old she gets.